ZapTXT is a free service that monitors your favorite website or blog feeds for particular keywords and alerts you as soon as a new item appears in that feed(s) containing the same keyword. You can choose receive updates via email, messenger programs (like Google Talk, MSN, AOL) or on your mobile phone as a text SMS message. Do not confuse Zaptxt with Google Alerts, Yahoo! News alerts or Keywords searches which are provided by various blog search engines. While all these services track the entire blogosphere for your keywords, Zaptxt lets you limit the search to only a set of RSS feeds that you have specified. So you are likely to receive only clean, useful and spam-free results. ZapTxt comes in really handy when are tracking high frequency feeds like Del.icio.us, Digg or Craigslist which have hundreds of new items every day. Or say have subscribed to Performancing, 37Signals and Problogger Jobs RSS feeds but are only interested in jobs that are either based in San Francisco or involve podcasting. Just setup up a Zaptxt alert with those keywords and relax. You can specify multiple keywords separated by standard boolean operators like AND, OR, etc. Zaptxt also accepts OPML files so even if you have subscribed to millions of rss feeds, just export them as an opml file and pass on to zaptxt. Very useful feature for RSS addicts. Another important note - Zaptxt is not a replacement of your RSS reader, it just keeps you informed about new articles in your feed reading list that contain your favorite topics [or keywords]. Therefore, it should really complement your feed reader especially while you are on the road when you just want to read articles related to a limited number of topics. The Zap It bookmarklet can site on the top of your browser and monitor any RSS enabled web page at the click of a link something like 1-click RSS subscription buttons but that don't use any rss reader. You can only monitor websites or blogs that provide RSS feeds. 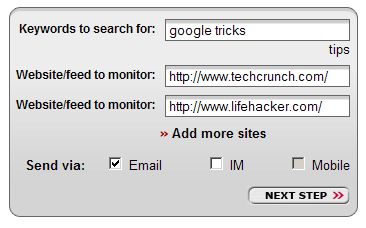 For tracking webpages without feeds, try ChangeNotes or WatchThatpage.